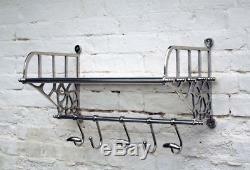 Wall mounted rack with hooks. Many uses, luggage, hat & coat, pots & pans, kicken towels & oven gloves. It's uses are endless. 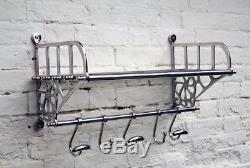 Stainless steel & cast aluminium construction with 5 rail shelf and 5 sliding hooks of two styles. No tools or screws required other that wall fittings, which are supplied. 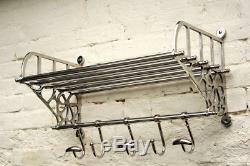 Our vintage inspired luggage rack is perfect for your hallway, porch, kitchen, bathroom. Dims WHD: 680 x 320 x 320mm (27" x 12.6") excluding hooks. Self WHD: 300 x 600mm (12" x 24"). Large, heavy items may take a little longer. We are unable to re-direct your consignment without making an additional charge. You can then call them to arrange an alternative date or collect in person. If any of the contents appear to be damaged, the package must be signed for as'DAMAGED' and we must be notified immediately. The item "NEW VINTAGE RETRO STYLE TRAIN HALL LUGGAGE WALL MOUNTED RACK WITH SHELF & HOOKS" is in sale since Tuesday, January 8, 2019. This item is in the category "Home, Furniture & DIY\Home Decor\Other Home Decor". The seller is "4himonlystore" and is located in HOOK. This item can be shipped to North, South, or Latin America, all countries in Europe, all countries in continental Asia, Australia.